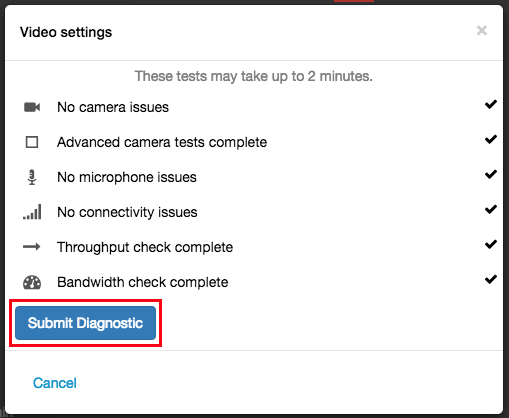 If your computer and system meet all the video chat requirements and you have issues with video chat, then run the video chat troubleshooter to check for issues. In the video toolbar, click the Video settings button. If something goes wrong, inform click Submit Diagnostic to report the issue. Make sure that the camera is not turned off in the PureCloud video toolbar. Make sure that a camera is connected. Make sure that no other applications are using the camera. Make sure that the microphone is not muted in the PureCloud video toolbar. Make sure that the sound for your computer is not muted or at a low volume. Make sure that a microphone is connected. Make sure that no other applications are using the microphone. If these solutions do not work, then try reloading the app or contacting your IT department.